Sears Modern Homes by architectural historian Rebecca Hunter of Elgin. General merchandise mail order catalogs were established in the 1880s, offering a wide variety of goods to the rural market. House plan books appeared at about the same time. 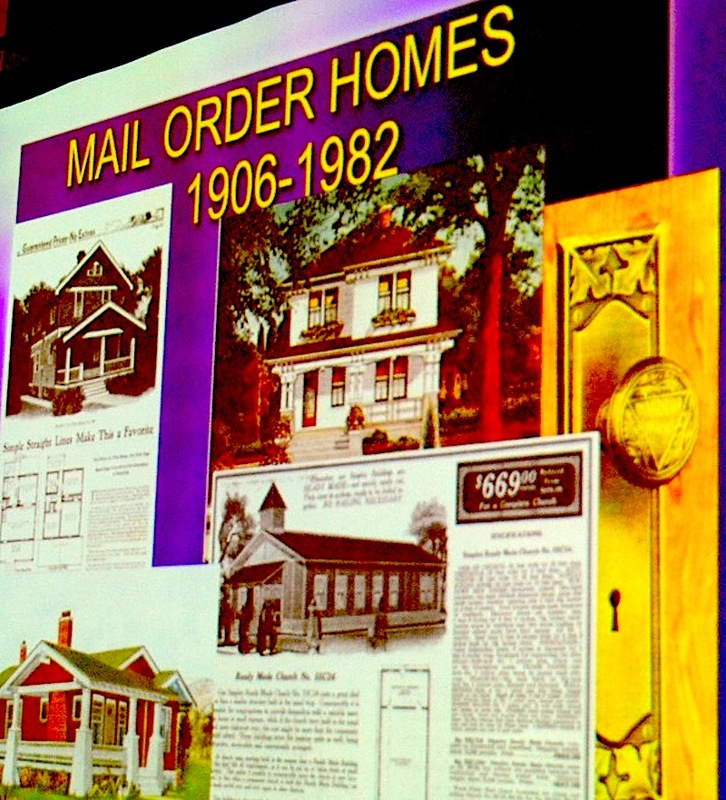 In 1906 a combination of these two marketing techniques first came on the scene: mail-order houses. Sears Roebuck is the best known of all the companies that sold mail order homes, although Aladdin Company was the first in the business. Attendees will learn the history of mail order homes and view images of homes from the eight major producers of these homes. More than 400 models of these kit homes were sold by retailer Sears Roebuck and Co. between 1908 and 1940 and up to 70,000 were built in 43 states – including many in McHenry County. What IS a mail order house? These homes were marketed by mail order catalog from 1906-1982. Eight major companies, and a host of small local companies, sold these homes primarily in the USA, but also in Canada. The company provided building plans and materials to construct the home. The materials were provided either as bulk lumber, or more commonly as precut framing boards. The latter were known as “kit” homes. The buyer received all the materials from one source: lumber, roofing, doors and windows, flooring, trim boards, hardware, nails, and enough paint and varnish to put 2 coats on everything. Electric, plumbing and heating fixtures were NOT provided as part of the house, but were available at extra cost. Materials were shipped primarily by rail, but also by boat, depending on the location of the plant and of the purchaser. Most buyers ordered from the closest supplier, as the buyer paid the freight charges. These well-designed, practical, homes were made of top quality materials. Lumber and hardware were purchased in bulk then the structural elements were cut to exact size at the mill and shipped to the customer by rail. Manufacturers claimed the pre-cut system would save the builder up to 30% compared to the cost of standard building methods. These houses were usually not distinctive architectural designs, but copies of the most popular styles of the day. House designs were standardized to reduce waste in materials, but customers were encouraged to personalize their order by moving windows or doors, adding porches, fireplaces, sunrooms, window boxes, trellises, or built in cabinetry, and by selecting exterior finish and colors. In the days before home power tools, precut homes represented an enormous saving in labor and materials for the home-buyer. Catalog prices typically included only the building materials; cost of the finished house, including the lot, the foundation, and construction labor was usually about double the catalog price. To promote their homes, companies placed advertisements in national magazines and newspapers in major cities. Pre-cut housing thrived until after the 1970s, when tract housing construction methods and increased popularity of prefabricated and mobile housing meant that pre-cut housing companies could no longer compete financially. Mail order homes are rare, only an estimated 2-5 percent of the homes built in the 1920s. The largest number was sold in 1928-1929. The 1920s' homes are located primarily in commuter suburbs of larger cities. Prior to 1920, when more than half of the population of the US was rural, many were built in rural locations. Who built them? Mail order homes were marketed to “the buyer of modest means”. Most purchasers were working class families, buying a single home for themselves. Most were probably assembled by contractors, although buyers with sufficient carpentry skills could do it themselves. Some professionals ordered the larger homes, or purchased custom designs from mail order companies. How do we know which are mail order homes? Matching the external appearance of a house to a picture in a catalog is not a conclusive method of identifying a mail order house, nor is oral history. These are only starting points. But, since only the Aladdin Company of Bay City MI preserved its sales records, for all other companies, the beginning step in this research is necessarily an attempt to visually match a house to an image in a catalog. Interior evidence, correspondence, and mortgage records are some of the means of conclusively identifying these homes. Below are brief histories of the major companies supplying precut homes in the United States and in Canada. Most west coast homes came from Pacific Homes, Aladdin, Montgomery Ward or Gordon-Van Tine. Aladdin, Lewis, Sterling, Sears, Gordon-Van Tine, Harris Brothers, and Montgomery Ward supplied the east, south and mid-west states. Aladdin and a Canadian Company, Halliday Homes, supplied most of the mail order homes in Canada. Crain, Bennett, St Johns, and Mershon & Morley were examples of small precut home companies with only local distribution. The first of the large mail order companies evolved in the year 1906, when an advertising executive in Bay City, Michigan saw the plans for a precut boat. William Sovereign realized that the precut system would also work for a building, and to test the idea, had a precut boathouse designed. The boathouse proved to be marketable, so William teamed up with brother Otto, a lawyer from Ohio, to form the Aladdin Company, named for the mythical genie who built a castle overnight for his master. Initially, Aladdin Company offered small cottages, but soon added a number of precut Arts and Crafts style residences. The Sovereign brothers ordered the lumber from the Lewis Company, also of Bay City, Michigan. As sales increased, Lewis needed to expand their production facilities, and at that time asked for partial ownership of Aladdin. In response to this request, Aladdin moved its business to International Mill and Timber. In 1913, Lewis Company published its own catalog of precut homes, featuring many designs it had manufactured for Aladdin. When a similar situation arose, Aladdin left International Mill and Timber, which then published its own catalog in 1915, under the name Sterling Homes. Aladdin next purchased the old Eddy-Sheldon Mill and resumed production, establishing additional production facilities in Oregon, Hattiesburg, Mississippi (1920-25), North Carolina and Canada. Aladdin continued to market precut homes and other buildings until 1982.
International Mill and Timber suffered a fire in 1917, which eventually resulted in bankruptcy. In 1920, the Sterling Company was purchased by Leopold Kantzler, and remained in business until 1971. Lewis Manufacturing also suffered a fire in 1925. After rebuilding their facilities, they changed the name of their housing division to “Liberty Homes” and continued to produce precut buildings until 1973. Aladdin, Lewis-Liberty and Sterling all survived the Great Depression, despite a 52% decrease in housing starts nationwide. During World War II these companies kept afloat by manufacturing barracks and temporary housing. The post-war housing shortage brought a surge of home orders, but sales then declined steadily. Sterling closed in 1971, having sold about 35,000 homes; Lewis went bankrupt in 1973, after selling about 60,000 homes. Aladdin closed in 1983 after selling about 100,000 homes throughout the United States, Canada, England and Africa. Sales records for the Aladdin Company are available at the University of Central Michigan, Mt Pleasant MI. The combined sales figures for these three companies appear to make Bay City the leading supplier of precut housing nationwide. A sawmill established in 1866 by U.N. Roberts became the parent of the Gordon-Van Tine Company, incorporated in 1907 to handle building materials. It is likely that the company name was derived from the middle names of 2 major stockholders, Horace Gordon Robinson and Harry V. Scott. 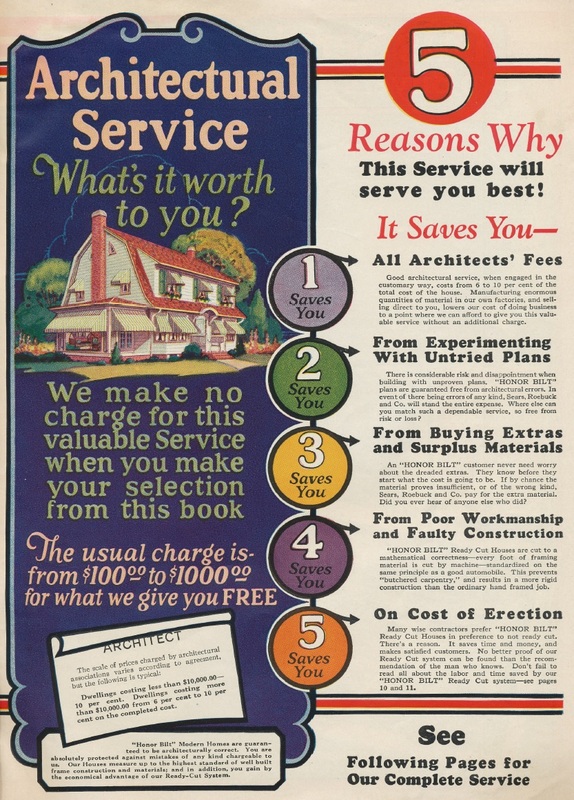 Gordon-Van Tine issued its first house plan book in 1909, and introduced its “Ready-Cut” home line in 1916. By 1923, the company had additional mills in Hattiesburg MS (1920-47) and Chehalis WA. Mortgages were offered on a limited basis from 1924 to 1931. Gordon-Van Tine continued selling homes through 1945. When the post World War II FHA price limits turned out to be less than the cost of production, Gordon-Van Tine and a number of other companies refused to sell lumber and building materials. In 1946, businessman Sidney Rose of Cincinnati bought the company, closed it and sold off the assets. In 1892 the company was founded as an architectural salvage company and incorporated in 1893 as Chicago House Wrecking Company. The four Harris brothers secured contracts for the demolition of exhibitions such as the 1893 World Columbian Exhibition in Chicago, and the 1904 St Louis World Fair. By 1908, they began offering house and barn plans, and selling the material and lumber to construct these. They pioneered sectional construction, offering bolted-together “Presto-Up” buildings as early as 1912. They also offered a line of “industrial housing” to companies wishing to provide employee housing. In 1913, the company name was changed to Harris Brothers. 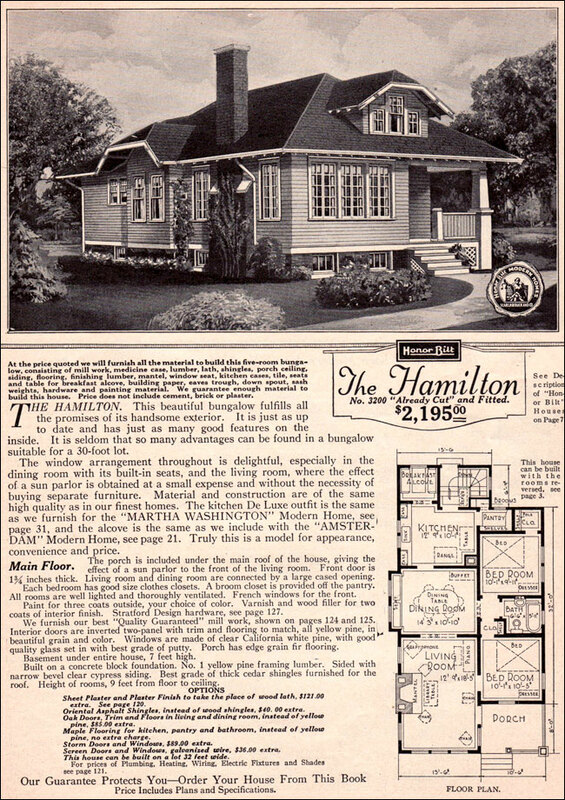 They published their first catalog of pre-cut homes in 1916. In the 1930’s, to attract more repeat business, the company began marketing materials to contractors rather than to individual homeowners. Harris apparently stopped selling homes around 1932. Wards introduced house plan books in 1909, featuring outdated turn-of the-century designs, many by architect William Radford. Wards apparently never owned or operated housing production facilities. There is evidence that the early homes were manufactured in Bay City MI at International Mill and Timber. Beginning in 1917, Gordon-Van Tine provided the materials for the homes marketed by Montgomery Wards. 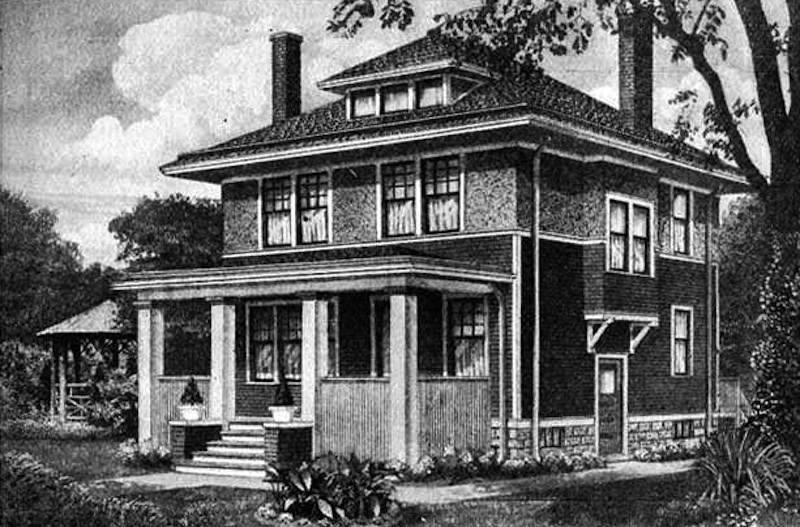 Pre-cut homes were introduced in 1918. The brand name “Wardway Homes” was used from 1918 until 1931, featuring the “ready-cut” system. Most of these homes are identical to Gordon-Van Tine models from corresponding years; only the model names and prices differ. Like Sears, Wards offered mortgage financing until 1931 when it closed its housing division, having sold an estimated 30,000 homes. Between 1908 and 1939, Sears Roebuck and Company marketed over 450 different models of homes by mail order catalog. From 1908 to 1915 Sears sold only plans and bulk materials. Sears and introduced precut homes or kits in its Modern Homes Catalog. . In 1916, Sears published a small catalog of “Ready-Made” Simplex Sectional buildings. In the fall of 1917, Sears began to offer mortgages in hopes of attracting customers who did not have the cash to purchase Aladdin or Gordon-Van Tine precut homes. Sears soon discovered that the mortgage business was even more profitable than the housing business. However, due to financial losses during the Depression, Sears discontinued mortgage financing in 1933, and continued to market precut homes of simplified design and lesser quality until 1940. Sears sold an estimated 60-70,000 homes from 1908 to 1940. A set of 12 building plans titled “Sears Modern Homes” with a 1941 date has been discovered, and some of these were built in Elyria, Ohio. In 1949-51 Sears began marketing 12 sectional models under the brand name “Homart” (from HOMan and ARThington streets, where the main Chicago office was located.) Although no later catalogs have become available to researchers, we know of Chicago area Homart homes from 1954 and 1965. The framing boards of a precut kit house were numbered in order to facilitate construction. After the house is built, it is usually possible to see some of these numbers. Presence of part numbers constitutes proof that the house is in fact a mail order kit. The style and location of the numbering may be a good indicator of which company built the house. The numbers are not visible on every board, so it may take a few minutes and a good flashlight to find one. Look on floor joists in the basement, attic rafters, basement stair risers and treads, wall studs - any visible framing board which has not been painted. Even in a kit, numbers will not be found on boards that were not precut: e.g. flooring, trim boards, doors and windows. 1. SEARS part numbers are stamped in dark ink. They are about one inch high, and from 1915 to about 1930 usually are a capital letter followed by one or more numerals, (e.g. A159, L23, C2). The numbers are usually near the end of a board, on the wider surface (for example, on the 4" side of a 2X4). Later they may be stamped in red ink or may be 2 numbers separated by a hyphen or slash (e.g. 13 - 9). Sears homes before 1915 were not precut kits, and so were not numbered. Model number or order number may be handwritten in grease pencil. 2. GORDON-VAN TINE/WARDS numbers are handwritten in grease pencil, usually in the middle of a board. They most often consist of numerals, hyphenated in groups, e.g. 17-21-19, or 3-5 digit numerals. Part names are stamped in ink, capital letters about 1" high (e.g. "ceiling joist" "top rail"). Model or order numbers may be handwritten 4-5 digit numbers. Delivery address may be stamped or stenciled in ink. 3. ALADDIN, LEWIS and STERLING Company: early numbers are handwritten in grease pencil, usually in the middle of a board and consist of numerals, usually hyphenated in groups of 2 or 3. Some of the numbers are fractions, e.g. 42-18-11 3/4. Later (after about 1928) numbers may be stamped in ink, 2 numbers separate by a hyphen, e.g.12-1. Part names may be stamped in ink. 4. HARRIS Brothers numbers are stenciled in ink, usually in the middle of a board, and may be numerals alone, or numerals and letters (e.g. 76, HR 50, RI 32). Model number and/or order number may be handwritten in grease pencil. Part names may be stamped in ink. 5. PACIFIC HOMES parts are marked in grease pencil with 4-5 digit numbers, and the names of the parts.